Created in 2017 through a merger of the Wildrose and Progressive Conservative parties, the UCP is projected to win or be leading 63 of 87 seats. 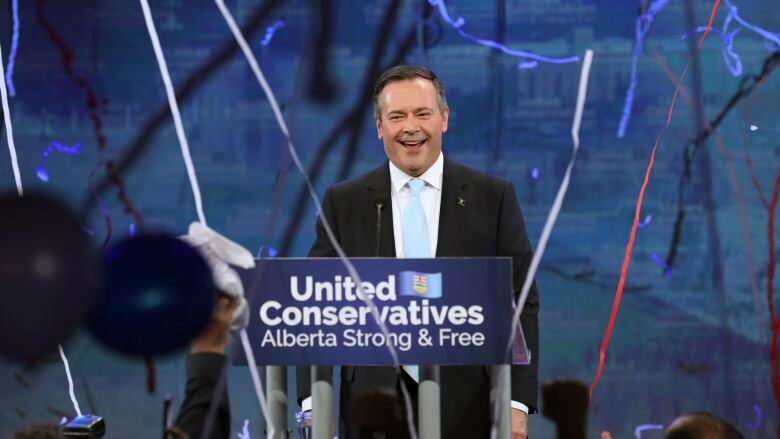 In his victory speech, Kenney vowed to get a "fair deal" with Ottawa on equalization payments and to fight other provinces and the federal government for pipelines. 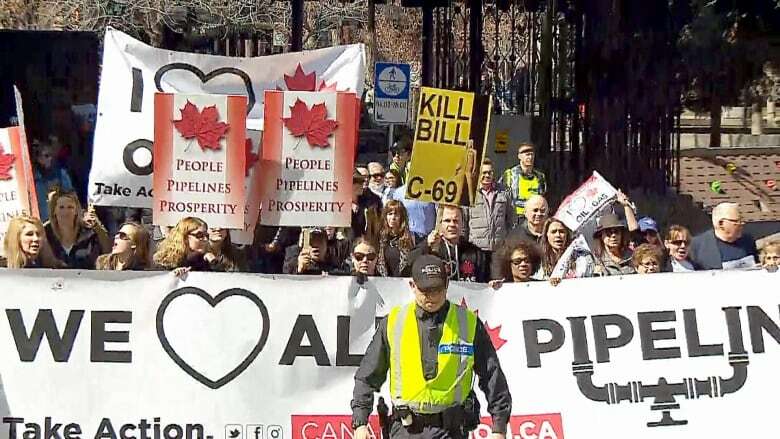 He also promised to combat "foreign-funded special interests" such as the Tides Foundation and the David Suzuki Foundation, which he accused of leading "a campaign of economic sabotage" against Alberta. "Your days of pushing around Albertans with impunity just ended," Kenney said as the crowd roared and chanted his name. Kenney thanked Rachel Notley for her "tremendous public service." "We will strive to be a government for all Albertans, not just those who voted for us," he said. Notley's NDP is projected to be elected or leading in 24 seats, down from 52, and will become Alberta's Official Opposition. The majority of NDP support was concentrated in Notley's home base of Edmonton. "It has been an incredible honour to serve as a premier, and it will be an honour to serve as leader of Her Majesty's loyal opposition," Notley told supporters in Edmonton. "Know you will always have a champion in me and in the Alberta NDP and a champion in the Opposition." The NDP lost most of the seats it won in rural areas in 2015. Several cabinet ministers went down to defeat, including Energy Minister Marg McCuaig-Boyd in Central Peace-Notley, Children's Services Minister Danielle Larivee in Lesser Slave Lake, and Shaye Anderson in Leduc-Beaumont. In Calgary, the UCP was elected or leading in 23 of 26 ridings. The NDP won three seats in Calgary: Kathleen Ganley in Calgary-Mountain View, Irfan Sabir in Calgary-McCall, and Joe Ceci in Calgary-Buffalo. Shannon Phillips was leading by fewer than 400 votes in Lethbridge-West. Kenney, who was a cabinet minister in Stephen Harper's Conservative government, won the leadership of the Alberta Progressive Conservative party in 2016 before leading the PCs into a successful 2017 merger with the Wildrose Party. That same year, he won the UCP leadership handily in a contest later marred by controversy. 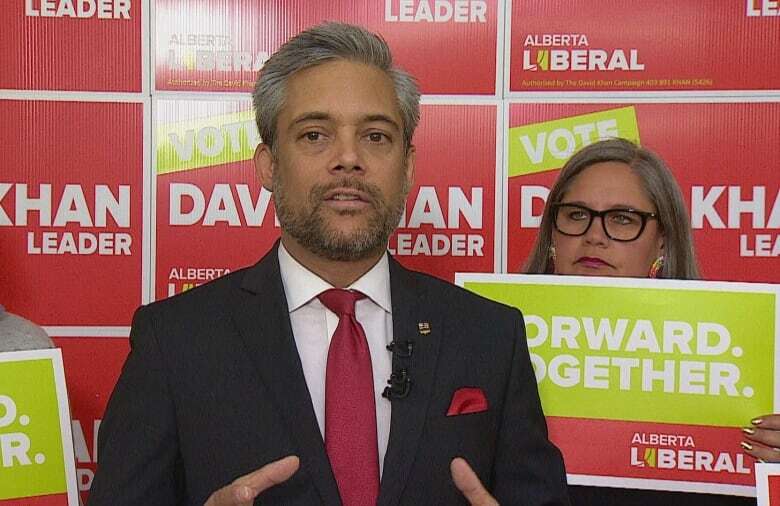 Liberal Leader David Khan lost in Calgary-Mountain View, the party's only seat in the legislature. "The political pendulum has swung away from moderate, progressive politics toward a more conservative position," Khan said. "That is the will of the people." "With your victory comes great responsibility. You will be the premier for all Albertans. 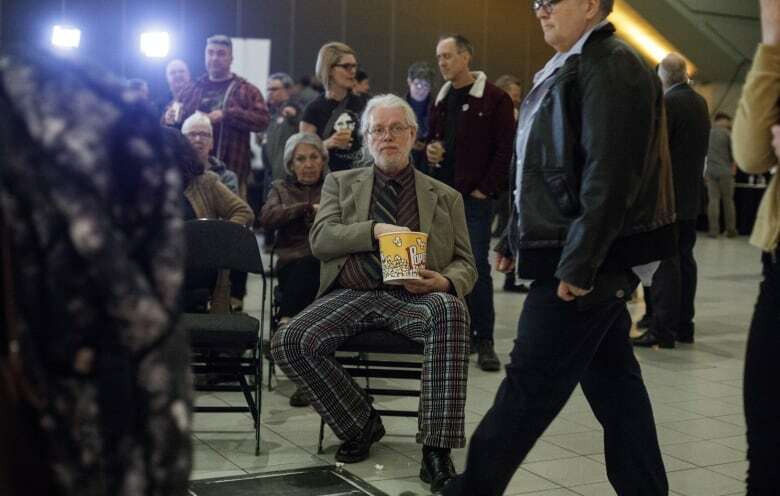 This includes the vulnerable, those with special needs and the LGBTQ2S+ community," he said. "Do not abuse your authority. Be fair and inclusive in your decisions." Alberta Party Leader Stephen Mandel finished third in Edmonton-McClung. Greg Clark, the party's former leader, lost his seat in Calgary-Elbow to Doug Schweitzer of the UCP. "I really believe, deeply, this is the party of the future in this province," Mandel told supporters. "When people get away from polarization and start looking at what a party can be, and what our province can be, hopefully, they will begin to look in a different way and see that the Alberta Party is the answer." Last week, CBC News revealed fraudulent emails were used to cast ballots for Kenney, and that the matter has come to the attention of the RCMP who have interviewed at least one person whose name was attached to a fake email address. Kenney has defended the voting process used during the party's internal campaign. Jason Kenney continues his victory speech, taking aim at what he calls "foreign-funded special interests" who are blocking Alberta's energy industry. "Tonight, all of that changes," he said. "Tonight, Albertans have decided that we will no longer passively accept the campaign of defamation against the industry. Let us unite, together, to unleash Canada's full economic potential." Supporters chant: "Build that pipe. Build that pipe." "Friends, today our great province has sent a message to Canada and the world. 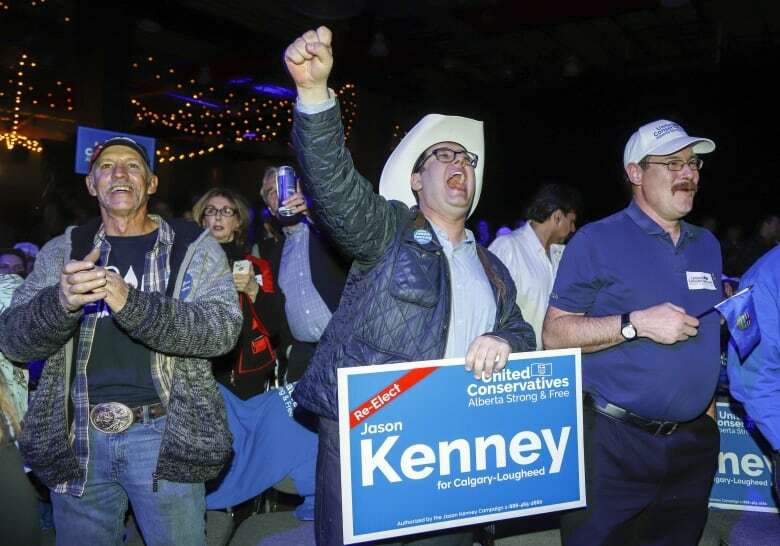 Alberta is open for business," premier-designate Jason Kenney told the crowd at UCP headquarters in Calgary. Prime Minister Justin Trudeau has congratulated Jason Kenney on his party's victory in the provincial election. "Albertans have chosen to elect a majority government led by the United Conservative Party," Trudeau said in a statement. "On behalf of the Government of Canada, I offer my sincere congratulations to Jason Kenney who will have the honour and privilege to serve as premier." He adds: "I look forward to working with the provincial government to create good, middle class jobs, build infrastructure, and grow the businesses and industries at the heart of Alberta's prosperity so the province can remain competitive in our changing economy. I also thank Rachel Notley for her years of service as premier." Three more Edmonton NDP candidates are re-elected: Nicole Goehring in Edmonton-Castle Downs, Rod Loyola in Edmonton-Ellerslie and Thomas Dang in Edmonton-South. The NDP's Marie Renaud keeps her seat in St. Albert. "It has been an incredible honour to serve as premier and it will be an honour to serve as leader of Her Majesty's Loyal Opposition," she tells supporters in Edmonton. The UCP's Dave Hanson is re-elected in Bonnyville-Cold Lake-St. Paul. The UCP's Peter Singh is projected to win a seat in Calgary-East. Singh's business was the target of an RCMP search last week. His lawyer confirmed the warrant was executed in connection with the investigation into allegations of voter fraud during the party's leadership campaign. The NDP's Debbie Jabbour loses her seat in Peace River to Dan Williams of the UCP. UCP candidate Nate Glubish wins in Strathcona-Sherwood Park, a seat that had been held by the NDP. UCP candidate Martin Long wins West Yellowhead, a seat also held by the NDP. NDP Leader Rachel Notley opens her concession speech with a joke to cut the tension: "I am very glad that we expanded Alberta's craft beer industry." 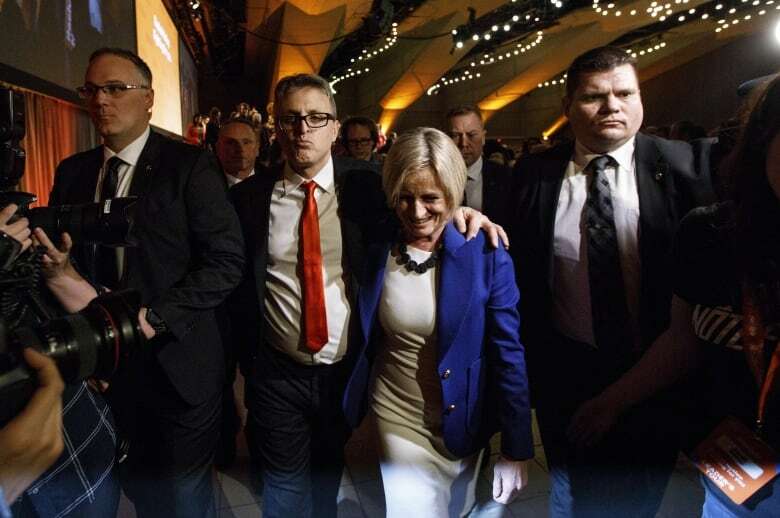 The loss to the UCP "isn't the result we hoped for," Notley tells a raucous crowd in Edmonton. "As I look out at all of you, I am filled with an enormous sense of gratitude and pride. I have gratitude for my team, a more dedicated group of public service, you will never find. To all of them — particularly those of them not returning to the legislature — you have my eternal thanks." The NDP's Jessica Littlewood loses her seat in Fort Saskatchewan-Vegreville to the UCP's Jackie Armstrong-Homeniuk. "Tonight Albertans made their voice clear, they voted for change," former Alberta Party leader Greg Clark says in Calgary. "I want to say a very special thank you to Rachel Notley. She governed Alberta with honour." "We have to be very proud," Alberta Party Leader Stephen Mandel tells supporters after it becomes clear he won't win in Edmonton-McClung. "We went from just over two per cent to over 10 per cent in the polls and it is still climbing. It was a very polarized situation … and it made it difficult for us. We have the most amazing candidates. They were an incredible group of people that I was proud to work with." 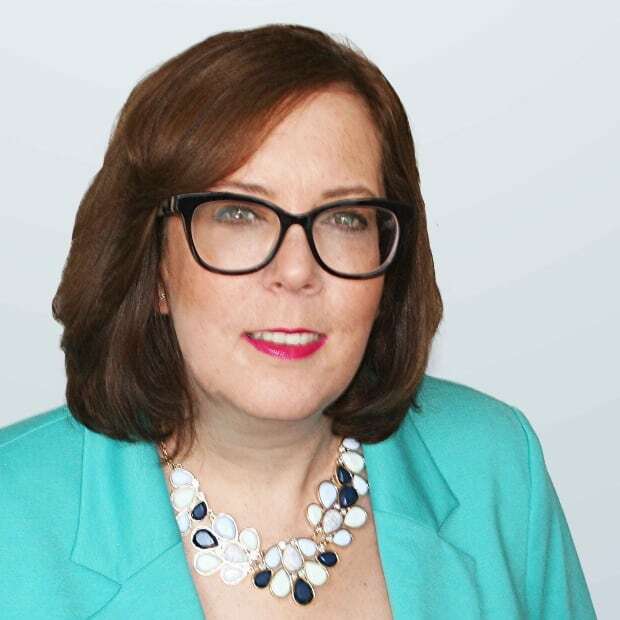 Another NDP cabinet minister is defeated: Energy Minister Marg McCuaig-Boyd loses in Central Peace-Notley to the UCP's Todd Loewen. UCP candidate Prasad Panda, who served as the party's energy critic, has won a seat in Calgary-Edgemont. The UCP's Rebecca Schulz has unseated former NDP MLA Graham Sucha in Calgary-Shaw. UCP's Jason Nixon is re-elected in Rimbey-Rocky Mountain House-Sundre. "I don't think the divisiveness we saw in this campaign was good for Alberta, I do think it brought people to our party," he said. The UCP's Michaela Glasgo is projected to win in Brooks-Medicine Hat. Close race in Edmonton-McClung: NDP incumbent Lorne Dach has 36 votes, the UCP's Laurie Mozeson has 27 and Alberta Party leader has 23 votes. Only one of 81 polls reporting. First polls to report: Mark Smith, the UCP's embattled candidate in Drayton Valley-Devon, is ahead with 178 votes, to 35 for the NDP's Kieran Quirke.